Are you looking for Absinthe cocktail recipes? By clicking on Absinthe Cocktails you will find a variety of cocktails with Absinthe. 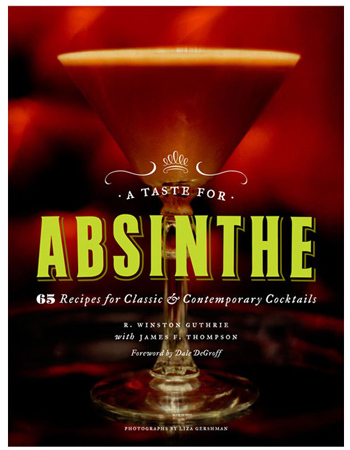 We can also recommend the Absinthe Cocktail Book "A Taste for Absinthe", which features classic and more modern cocktail recipes with Absinthe. It is really an indispensable guide to create world-class cocktails using the once illicit drink called the Green Fairy. Of course you need some Absinthe to mix your cocktails. In our shop you find a large variety of different Absinthes. You can order as well some exclusive barware like bar jiggers, copper mugs and cocktail glasses. Hard to say which one is the best Absinthe cocktail, but we like Hemingway's drink Death in the Afternoon: You fill a glass with 200ml Champagne, then you add a shot (really only a small shot) of Absinthe. Don't add too much Absinthe, the Green Fairy is only used to give the Champagne a special note. The refreshing notes of anise and fennel perfectly fit to the dry fruityness of Champagne. You will get the best optical effect, if you use a red Absinthe. For example Absinthe Hamlet Red, which you can buy in our Strong Absinthe section of the store. If you are a Goth inspired Absintheur, use Absinthe Gothica. The black-violette color of the Absinthe will create magical black swirls in the glass. More traditional Absintheurs can use any naturally colored Absinthe. As Absinthe louches as soon it is mixed with water, any Absinthe will give the Champagne a slightly cloudy color, which looks quite mystical in the glass. Absinthe has an effect that is different to normal alcohol consumption. You will experience a mental and physical activation. It is not an overpowering highness - you can describe it as an activation of your senses. If you mix your cocktails with Absinthe you can say that you add an extra benefit to them. Try it, it is a pleasant experience. In case you want to learn more about the feffects of real Absinthe, you can read more about the effects of Absinthe here. Where can I buy Absinthe for Cocktails online? You can easily order your bottle of real Absinthe at our webshop www.alandia.de. We ship to the USA on daily basis. The delivery is 100% guaranteed, which means you can place your order without any worries. The delivery is done via Express shipping, which means you will have your bottle of the Green Fairy within 2-3 days (you can read more about ALANDIA's Delivery Guaratee at this site: Buy Absinthe in the USA). ALANDIA is in the business since the year 2001. Therefore you can expect professional and experienced service! Check out as well our ALANDIA Facebook page with more than 15.000 fans, we wouild be happy to welcome as well you in the community!